Picked up all toys, clothes, and artwork from floor. Straightened MJ’s “studio.” Put all beads, pipe cleaners, stickers, “treasures,” and stamps back in their designated bins, muttering under my breath the whole time. Mopped kitchen and utility room. Wrote fundraising e-mail to committee of Winter Faire at MJ’s school. Attempted–twice–to reach donation department at Home Depot. Want them to give two Christmas Trees for our Faire. Won’t get hopes up–they won’t even spring for voice mail. Wrote e-mail to work, asking for days off so that I can attend important Halloween events with MJ. Worried I’ll be denied. Attempted to play with cat. Desisted, due to lack of interest. 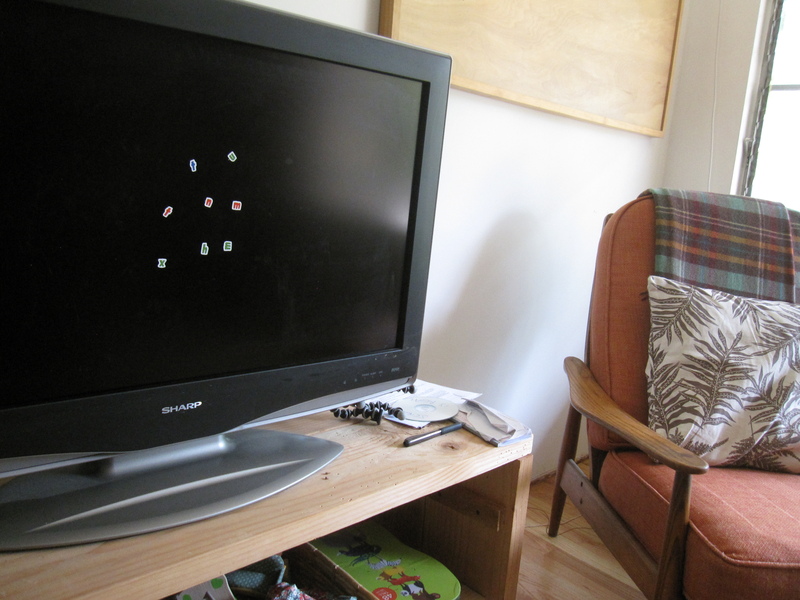 Removed one more alphabet sticker from flat screen TV. At this rate it will be cleared of them completely by 2014. Attempted to remove glue from coffee table. Failed. Attempted to remove piece of construction paper pasted to bathroom sink. Failed. Scanned and e-mailed banking forms for our life insurance company. We fell victim to fraud again (!!) last week, and have had to close our old checking account and open a new one. This has meant contacting everyone we do online billing with and giving them our new routing number, etc. Next time an innocent-looking teenager comes to our door selling newspaper subscriptions “for her school” and asks me for a voided check I plan on assaulting her with a stepping stool. Tomorrow, at least, I get to go back to work. Maybe I’ll even get a manicure on my lunch break. That’ll feel like a day off, indeed. This entry was posted in cat, childcare, cleaning, dog, Garden, household, laundry/ironing, To Done and tagged fundraising for preschools, home depot donations, house cleaning, newspaper subscription fraud, to done, winter faire, work of a stay at home mom on October 8, 2013 by thumbstumbler.